We started decorating for Halloween the other day. I love Halloween. And usually the best part is the planning, what you’re going to dress up as, what you’ll do, what kind of candy you’re going to eat. It’s all pretty great. I’m looking forward to it this year especially. Last year, I had TONS of kids come by the house. Most were afraid of Johnny Cash, (one kid literally said, “THAT. IS. A. WOLF.” and refused to come get candy. ), but it was great to see some neighborhood kids all dressed up. Anyway, as we start getting ready for Halloween this year, I wanted to reminisce about some crafts and costumes I’ve done over the past few years. I always love carving pumpkins, and it’s a pointless point of pride that I never use a template. I always just make it up as I go. My pumpkin is in the middle (the Jill-o-Latern, if you will). 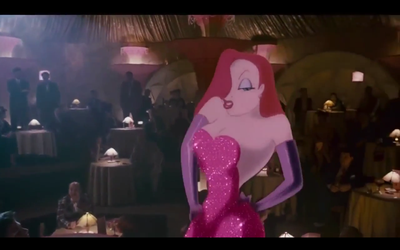 I had an unhealthy obsession with Jessica Rabbit when I was a kid. I just thought she was the most beautiful Disney character there was. Secretly I’ve always wanted to be a red head too head. I made the dress and the gloves from Fabric Store. I used a dress pattern to cut the dress pieces, but as I never measure correctly I had to take it in three or four times. It was a fun Halloween, one of that last I did the twenty-something bar crawl in D.C. I made these cupcakes for a Halloween party, and they were about the most fun cake decorating project I’ve done since I started baking. I got the idea from Martha Stewart. A couple of bags of candy, a box of cake mix and some food colored ice cream, and you can do it too! I REALLY wanted this show to take off (hehe, get it, like a plane, taking off… nvm). This was the most intensive sewing project I’ve ever done. I made the suit jacket, the skirt, the gloves, and the hat. The only part I didn’t plan for was that Halloween was actually on a Tuesday, and everyone had gone out the Saturday before. So really, this picture is of me and my old roommate sitting in an emptyish bar, because the costume HAD to be seen. And it was, by only us, a bartender and very bored looking bouncer. But it turned out pretty great! Man, I really buy into the female tropes presented on TV and movies, don’t I? When I was a kid, I had the same long black hair as Disney’s historically inaccurate portrayal of what was probably a 13-year old girl. She was the first Disney character that looked like me though, so I’ll always love the movie even if it is a tad bit creepy. The costume was pretty easy to create, I made the dress in under an hour. The necklace was the most expensive thing, beads are surprisingly costly. This was my favorite costume ever. I wasn’t freezing, uncomfortable, or gawked at by creepy dudes. Additionally, it was the cheapest costume to make. I went to the Goodwill and just got some white pants and a white polo. The rest was no more than $10 at the craft store. I’m not sure what or if we’ll dress up this Halloween. We’re currently doing Dave Ramsey’s Financial Peace University, so we’re saving our money right now. I will be decorating the house, since we can use most decorations from year to year. Besides, how will trick or treaters know if we’re handing out candy if our house isn’t all gussied up? 25 more days until Halloween!